The bestselling Inspire Bible is a beautiful single-column, wide-margin New Living Translation coloring and creative journaling Bible that has become a treasured legacy Bible for many. The Inspire PRAISE Bible has even more beautiful line-art illustrations to color, with nearly 500 all-new full- and partial-page Scripture illustrations attractively displayed throughout the Bible. 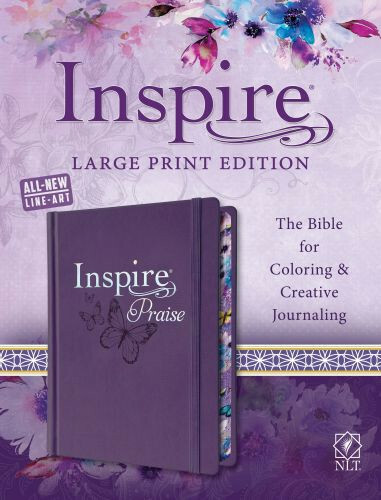 Inspire PRAISE includes thirty-two colorful and beautifully-designed transparent praise-themed journaling pages to enhance your coloring and creative journaling journey through the Bible. They are placed throughout the Bible to provide extra space for prayers, praises, or additional creative expression. Leave traces of faith—and PRAISE—throughout the Bible for a treasure that will truly inspire!